The menu button is also "legacy" according to Google. Having used a Galaxy Nexus (which doesn't have one), I think that's a big mistake. Back on topic, if Google wants everyone to be using the latest and greatest version of its OS, they shouldn't have made it open source and infinitely hackable by OEMs. I'm considering switching to Windows Phone when I replace my current Android. By then, Windows phones will support dual core processors and, hopefully, more than one screen resolution. So what do you think "Legacy" means? I'd suggest that 2.x is Legacy simply because it's outdated and no longer maintained. The installed base doesn't really matter. @Dave: I guess it really is a matter of interpretation. When I hear "legacy software," I think of software written for operating systems that are no longer in widespread use. @The Dave: The installed base very much matters for developers. "Legacy" usually implies "you don't need to worry about this so much." So yeah, from a technical point of view, 2.x might be legacy, but if you actually want to SELL any apps, you pretty much MUST support it. Did you read those numbers? 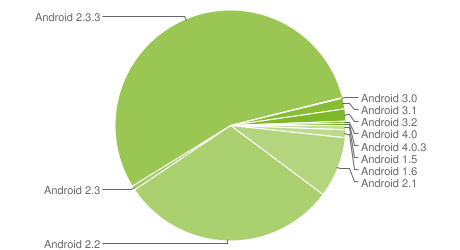 Less than *four percent* of all Android devices are on 3.x or newer--and given how much telecoms aren't updating Android devices, that number will grow very slowly. It would be helpful if you write about your experience or lessons you have learnt while creating the mobile apps. Hopefully the lessons which you have learned will be helpful for other mobile developers like me who can learn it from your blog post. Yeah, Google's use of "legacy" is...inconceivable!